Originally published under the title "Turkey: America's Really Bad 'Faustian Bargain'." There is no end in sight to renewed violence between the Turkish government and PKK guerrillas. Many people believed that the Turks and their Kurdish compatriots were close to a historic handshake when, in 2013, the imprisoned leader of the Kurdish separatist movement, Abdullah Ocalan, declared a farewell to arms after a three-decade-long violent campaign that had left nearly 40,000 dead -- Turks and Kurds. The Turkish government would grant broader political rights to its restive Kurds, who demand regional autonomy. In return, the Kurds would conduct politics peacefully instead of seeking their rights with rifles in their hands. Slightly more than two years later, Turkey's predominantly Kurdish southeast is seeing the same bloodshed it saw before the 2013 truce. On July 20, a suicide bomber belonging to the Islamic State of Iraq and Syria (Islamic State, or IS) murdered more than 30 pro-Kurdish activists in a small Turkish town bordering Syria. Before that, another IS operative detonated a bomb at a Kurdish political rally in Diyarbakir, the capital of Turkey's Kurds, killing four people and injuring over 200. The jihadist attacks on Kurds ignited a new spiral of violence from the Kurdistan Workers' Party (PKK), the notorious armed wing of the Kurdish political movement. 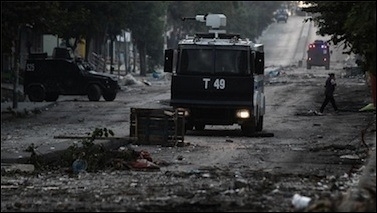 An autonomous PKK cell killed two Turkish police officers at their home during their sleep. In retaliation, Turkey has since been pounding PKK strongholds in northern Iraq. Between June 1 and August 29 of this year, a total of 129 people (over 50 civilians) were killed in clashes, and 526 were injured. Those numbers must be higher by now, as every new day adds to the death toll of the Turkish-Kurdish conflict. The number of casualties does not include the nearly 1,000 PKK militants the Turkish military claims it has killed in ongoing air strikes since late July. The combined Turkish-Kurdish death toll should now be close to 1,500. Turkey is fighting the Kurds at home and in Iraq; but it also has friendly economic ties with the Kurdistan Regional Government in northern Iraq, which has been trying to perform a balancing act between Turkey and their more radical brethren, the PKK. Turkey recently joined the allied campaign against IS. So, Turkey is fighting IS and, at the same time, its regional nemesis, the Syrian Kurds. The Kurds are fighting both Turkey and IS, Turkey's declared enemy. Turkey is a NATO ally and a partner of the U.S.-led war on IS, but is also fighting the Kurds. The Kurds are the only "[proxy] U.S. boots on the ground in the fight against IS." Too complicated? Just Middle Eastern. And note that the "friend-and-foe" tableaux here is only a microcosm of much more complex and broader affairs in this part of the world. Turkey cannot fight IS and Kurds at the same time forever. One thing, however, looks like a near certainty. Turkey cannot fight IS and Kurds, the essential ground force of any coalition campaign against IS, at the same time forever. The Turkish campaign against the PKK sounds as if it is an air force bombing allied ground troops. America's deal with Turkey will prove to be a Faustian bargain. Short-term operational convenience is not worth the long-term danger of destabilizing Turkey and demoralizing the Kurdish forces that have carried the bulk of the burden in fighting militants. An ally racked by violence and insurgency simply can't play the role that the United States needs a secular, democratic Turkey to play in the turbulent Middle East. Fortunately, America does have leverage. Turkish officials desperately crave the approval of their counterparts in Washington; the United States must not grant it. Instead, the Obama administration should restrict Turkey's access to senior-level meetings, reduce intelligence cooperation and withhold American support for Turkey in international financial institutions in the likely event that Mr. Erdogan's policies precipitate an economic crisis. Getting Turkish leaders to change course will be extremely difficult, but it is imperative to pressure them if Turkey is to avoid being sucked into the vortex created by a failed Syria policy and Mr. Erdogan's dogged quest for absolute political power." Edelman is right. Turkish President Erdogan's dogged quest for absolute political power is not just poisoning Turkey but also its allies and their fight against Islamist extremism.